Rovio has a lot riding on its new animated movie. Earlier this month, the Finnish company reported a €13 million ($14.8 million) operating loss for 2015, blaming "heavy investments" in future projects. The popularity of Angry Birds is waning, but a commercially succesful film could be its salvation. As such, it's developed a new app called Angry Birds Action!, which rewards players for seeing the movie on opening weekend. Players that open the app during the end credits will be treated to an "exclusive movie clip" and a new area of the game to explore. The feature is triggered by an "inaudible digital watermark" that plays in the background. Angry Birds Action! 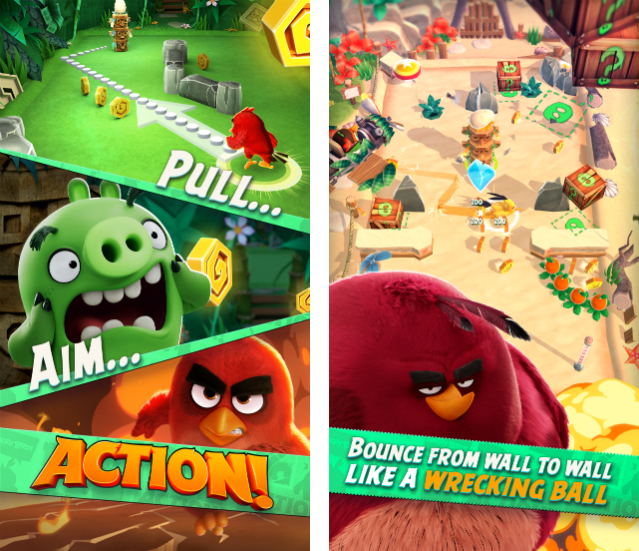 combines classic pinball and the trademark Angry Birds 'pull, aim and fling' gameplay mechanic. In each level, you'll be guiding Red or one of his furry friends through a gauntlet of eggs, ice and wooden crates. The birds only have so much momentum, so it's your job to collect all of the eggs using a limited number of swipes. It's a high-production effort, but nothing that would change Rovio's fortunes on its own. To keep players engaged, Rovio is offering mini-games and AR extras that can only be unlocked in the real world. Each LEGO playset featuring the Angry Birds characters will, for instance, come with a QR "BirdCode" in the instruction manual that unlocks extra content. A similar "Whack-a-Pig" game and the ability to take "selfies" with Red can be unlocked by scanning a McDonald's Happy Meal. Other retail partners include Walmart, Toys R Us and H&M. It's a clear effort to keep Angry Birds fans -- new, old and recently lapsed -- thinking about the movie and Rovio's apps. If that doesn't change people's interest in the brand, it's going to be another difficult, turbulent year for the Helsinki-based game developer.